Log in with your campus email (@mansfield.edu) and password. Limited number of users can use this at one time. Please Logout when you are done. Search the MU Catalog for the music or audio book. Be sure to select the "MU Catalog" scope for your search. 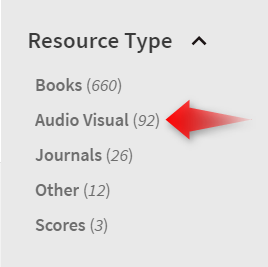 If you need to limit your results, on the right side of the screen, limit the Resource Type to "Audio Visual"
If you need to further refine your results, you can limit by location. Music CDs are on First Floor South. Audio Books are on First Floor North. You will know you have located a recording when you see the word "Audio" above the title. WORD OF WARNING: "Audio" items include CDs, cassette tapes, vinyl records/phonodiscs, and streaming audio. Look at the call number to verify what format the recording is in. If it says "Online", it is streaming online and not in the library.